As the final notes of “Goodnight, Irene” rang out through the Armadillo World Headquarters, it signaled the end of an era. The farewell to the iconic music venue had begun on New Year’s Eve 1979, but now, at 4 a.m., it had turned into a bittersweet final celebration of the memories made within the walls of the old National Guard Armory. When Asleep at the Wheel frontman Ray Benson sang, “Goodnight, I’ll see you in my dreams,” ending his impromptu set, he said goodnight to the Armadillo, and it began to sink in for the thousands of attendees that Austin would have to go on without the venue that had completely transformed it since its opening in 1970. For Benson, it was the reason the West Virginia band had finally settled in Austin after a stint in Oakland, California. It was one of the reasons Willie Nelson made a home in Texas. It was a place where hippies, cowboys, and punks headlined alongside each other, where children were conceived in the parking lot after concerts, where an undercover narcotics agent could come for the music and stay to pass around a joint with the crew. It was where, after stumbling upon it one night in 1970, Eddie Wilson, ’67, created a family—a haven for Austin’s weirdest to be themselves. Since its inception, the venue had gained a reputation for booking diverse acts including AC/DC, Frank Zappa, and Bruce Springsteen. But after a decade of concerts, the venue was forced to close its doors. The writing had been on the wall for years. Massive debt and red ink-stained balance books led Wilson to walk away on Nov. 1, 1976. Save for one concert, he’d never again set foot in the building he spent years pouring his heart into. He had passed the torch onto Hank Alrich, a musician who originally came to the Armadillo to play, but stayed long enough to donate money for its famous beer garden and keep it running during its final years. Things were briefly looking up after Alrich took the lead, but it wouldn’t last long. After Alrich took over, the idea of saving the Armadillo didn’t seem impossible. The employees were making money again, and the business was finally in the black, but after searching for years, the Armadillo’s landlord, M.K. Hage, had found someone willing to buy up the 76 acres it sat on. Reality sunk in. The Armadillo wouldn’t last forever. Rather than go out quietly, some of the venue’s best acts performed in those final months. Frank Zappa, the Talking Heads, Arlo Guthrie, and the Charlie Daniel’s Band were just a few of the performers to come through the doors. That last year also saw the dawn of punk rock in America. And with the punks came Jesse Sublett and The Skunks. 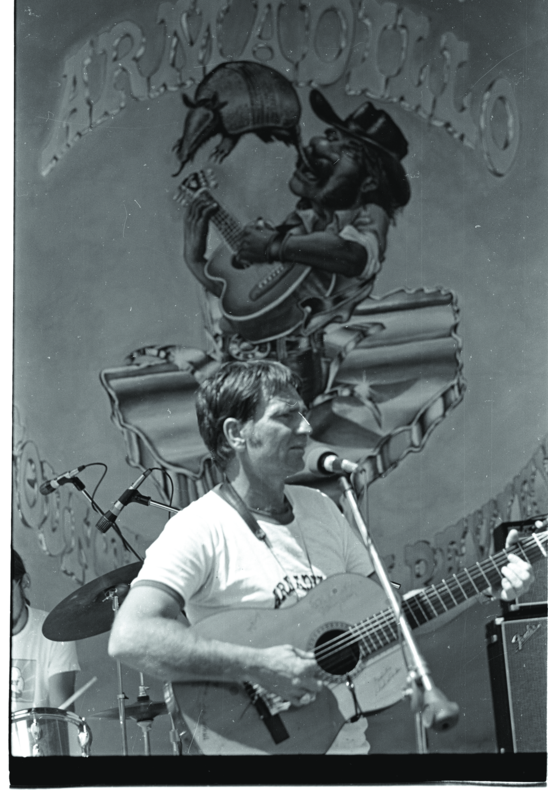 Willie Nelson performing at the Armadillo, in an undated photo. It had all the makings of a classic night at the Armadillo: local mime and magician Turk Pipkin, a staple at the venue, got the crowd together to participate as he mimed the rolling and lighting of a colossal joint. Jim Franklin, iconic Armadillo poster artist, was educating people on the history of the Armadillo and the parallels between the misunderstood animals and Austin’s own hippies. Kenneth Threadgill floored the audience with his yodeling skills, and, moved by the energy and not yet wanting the night to end, Ray Benson took the stage, pushing back the end of the Armadillo from midnight to 4 a.m.
Leea Mechling, ’76, had been a part of the core Armadillo crew since 1974. From her first time seeing the Ramones and The Clash, to the time bluegrass musician John Hartford helped lull her son to sleep backstage when she needed to work, some of her best memories had been made within the venue’s walls. No matter how great the last night was, it still kept sinking in that it was the end. Across town, Wilson had returned to the place where it all began for him: Threadgill’s. During one of his many forays into life as a UT student in the early 60s, Wilson would often venture over to that gas-station-turned-beer-joint on Wednesday nights to see Janis Joplin perform. Without those Wednesday nights watching students drive over just to hear Joplin’s voice, there might not have been an Armadillo. Now, years later, Wilson was on his hands and knees getting Threadgill’s—now a fully-fledged restaurant paying homage to his mother Beulah Wilson’s home cooking — ready for it’s grand opening the next morning. As the night ended at the Armadillo, and people reluctantly left the venue for the last time, many of them drove right over to Threadgill’s. On January 1, 1980, Eddie Wilson’s first customers were the Armadillo crew. For a year, the Armadillo was left empty and untouched, until the bulldozer came in 1981. As the wrecking ball came down on the Armadillo’s storied stage, Wilson says some people saw glitter rising up into the sunset—one final reminder of the life that had existed on the now-vacant lot. After a decade, the Armadillo was gone. But no one could forget it. In the years after he left, Wilson continued to write the book he says he’s been working on since he was 10: the story of the Armadillo and everything that led up to its beginnings. Never did he imagine people almost 50 years later, still talking about the venue he called a home. Inside the National Guard Armory, history had been made and the future of Austin’s music scene forged. 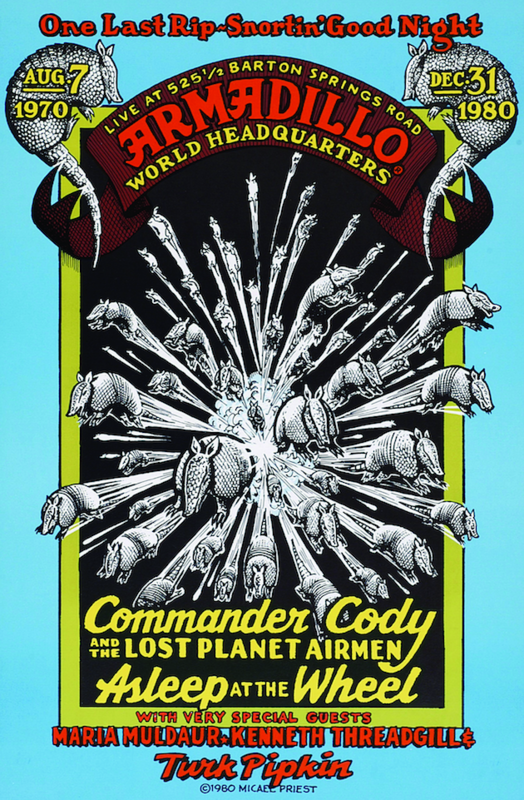 Now, the book, Armadillo World Headquarters: A Memoir, is full of stories detailing how the club came to be, anecdotes of the larger-than-life personalities that graced its stage, and the stories of the Armadillo’s role in the creation of so many Texas staples, from Willie Nelson’s Fourth of July Picnic to Austin City Limits. But two years before its publication, Wilson was stuck. The writing process had come to a halt and, looking for help, he reached out to Sublett to come on as co-author. By that time, Sublett had written several books of his own and was more than happy to write about the venue that had inspired him as a performer and attendee. Sublett filled in some of the blanks that came with Wilson’s departure and added in some of his own anecdotes and memories, but, even together, the two of them were still searching for an ending fitting enough to cap off the venue that was still on people’s minds. On Jan. 15, 2015, they found it. Thirty-eight years after the Armadillo closed its doors, its memory persists. Aside from the auction, there are Facebook groups, where former concertgoers reminisce about their favorite shows. To this day, Sarah Cunningham, UT adjunct professor of information science and a member of one of the online groups, still remembers walking down from the dorms down to the Armadillo for the first time to see Canadian country musician Anne Murray play. But her favorite concert was in September of ’79, just months before the venue closed. Cunningham got a glimpse of the communal atmosphere the Armadillo had fostered, just before it was set to expire. Poster by Micael Priest. Willie Nelson photo by Burton Wilson.